Governor of South Carolina and rising Republican star Nikki Haley isn't worried about her conservative brethren's seemingly shortsighted decision to fixate on limiting access to women's reproductive health care. Why? Because, she explains, ladies don't care about that stuff. She's right. We ladies are much more into tax breaks for the rich and deporting the illegal immigrants that don't reside in our uteruses and fluffy, fluffy kittens. All of my policy is not based on a label. It's based on what I've lived and what I know: Women don't care about contraception. They care about jobs and the economy and raising their families and all of those things. Apparently in Haley's world, "families" just spring from the ground like plants that don't cost tons of money or cause any sort of pain or discomfort to the woman who actually have to be pregnant. Actually, little known fact — in South Carolina, you can bring a baby to a bank in exchange for an entire bucket of quarters, so there's really no inconvenience or expense involved. While we care about contraception, let's be clear. All we're saying is we don't want government to mandate when we have to have it and when we don't. We want to be able to make that decision. Judging by that quote, you'd swear Nikki Haley hadn't spent much of her political career actively trying to pass laws that force pregnant women to be pregnant and making it illegal for them to decide otherwise. 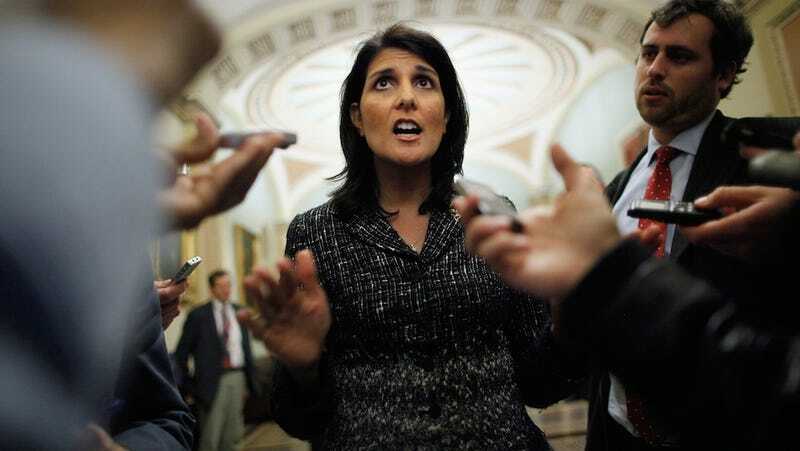 Haley's long been an advocate of protecting a woman's right to choose exactly the path that Nikki Haley wants for her or face criminal penalties. Truly an advocate for women, in addition to apparently being their spokesperson.